It’s a familiar foe, but quite different circumstances for the Korean side of the equation. With rumours swirling that this could be Uli Stielike’s last game in charge of the Korean national team, and passage to Russia 2018 not far from a total toss-up, there’s a lot on the line in this World Cup Qualifying match – this, the Korean national team’s final game of 2016. As it stands, Uli Stielike’s side isn’t sitting in the most comfortable of positions. October’s shocking 0-0 draw with Syria and last month’s shortfall in Tehran has seen the Koreans amass just 7 points from their first 4 matches. Uli Stielike’s roadmap to his personal objective of 23 points (a number he says would ensure qualification) goes right through Uzbekistan. Though as it stands, neither Qatar, nor Syria, nor China pose a realistic threat to breaching the group’s top three, the South Koreans know that a defeat would be a major blow to their hopes of ending the year above 3rd place – a position that entails the unknowns of an AFC and intercontinental playoff. 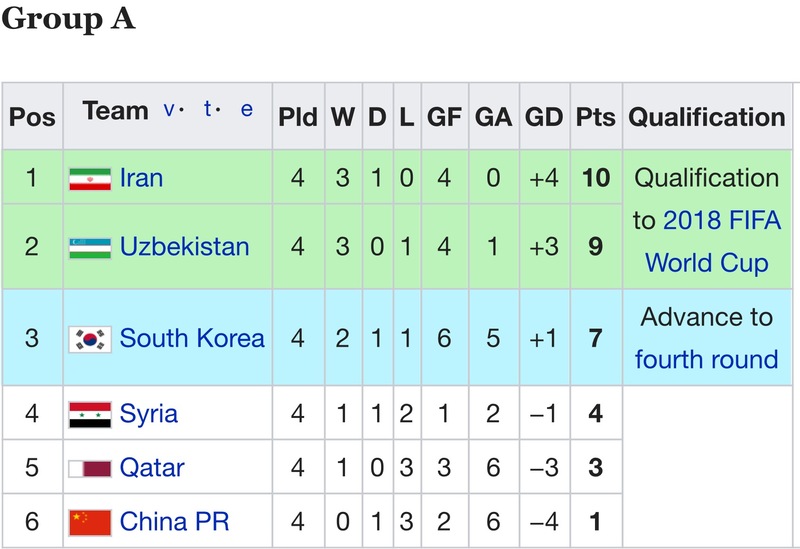 We Global Football’s simulations still have Korea at a 75% chance of qualifying to the World Cup, but they are most probably banking on Korea being able to best the Uzbeks for second place, with the Iranians finishing top – precisely the outcome of the previous qualifying campaign. Stielike’s last game in charge? 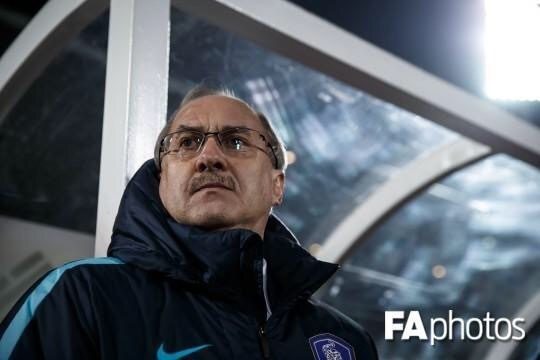 With a meeting of the KFA Technical Committee convened at the conclusion of the November international break, it is highly probable that Uli Stielike will not survive the new year as Korean national team boss should the Koreans put anything less than 3 points on the scoreboard at the end of this match. Even at that, a source is quoted as saying “we (the technical committee) will discuss appointing a manager for the U-20 men’s national team and the Korean senior men’s national team”, seeming to infer that Stielike is skating on very, very thin ice indeed. If I can permit myself to be a bit more opinionated – how really surprising is it? For so many Korean fans, it’s deja vu. A series of unconvincing wins, avoidable dropped points here, another loss to Iran there, and suddenly you’ve got a national team in turmoil, fans sweating about World Cup plans and a manager on the chopping block. Maybe in Middle Eastern football, this is considered a totally acceptable and normal phenomenon, but in the less trigger-happy East Asian footballing world, Korea’s revolving door of national team managers hasn’t really let any ideas take full form. Then again, what ideas has Stielike had? There’s no doubt that consistency in player selection from the Hong Myung-bo era did the team some good – say what you want about Hong’s reign, but he took a national team in disarray and tried to give it some sort of structure, on and of the pitch. So, building off of the now-Hangzhou Greentown’s boss’ successes was never a bad idea. Not all successful ideas have to be radical, after all. But the key issue now with Uli Stielike is two things. Off the pitch, as I detailed last month, Stielike seems to have lost the respect and command of the dressing room. On the pitch, his anachronistic tactical perception of the game (all about conserving possession and the slow, methodical, watered-down tiki-taka approach, in addition to his obtuse emphasis on wing-play) has made Korea predictable to sides who have organized, hard-working defenses. Stielike isn’t going to change anything in this match – not at least in terms of how he perceives successful football to be – he’s stuck to it his entire managerial career, with adaptation nor modification. Where he could succeed is making a couple tweaks in player selection that in my view will help him re-gain the support of the fans, freshen up the Korean attack and with three points, help him re-gain the trust of the team and the KFA. But more on that later. Uzbekistan, Uzbekistan, Uzbekistan. This will be Korea’s 7th meeting with the White Wolves in 6 years. As Tomas Danicek outlined for us yesterday in our Questions & Answers session, the Uzbeks have changed mightily since the two countries last met in a friendly in Daejeon last year. Danicek actually goes as far as calling Uzbekistan an “antithesis” to the Korean side. Though the Korean national team hasn’t really changed too much (look at the line-ups in our sides’ last two meetings), the Uzbeks have undergone many reforms in player selection. Their defense, led by CSL centreback Egor Krimets, is rock-solid of late. And at the managerial level, no one is calling for the head of (surprisingly somewhat corrupt) nationally respected manager Samvel Babayan. But there are some similarities to be drawn. Uzbekistan are underwhelming – at least, their star players are. Server Djeparov’s hallmark set piece delivery has “turned to crap”, while usually prolific Igor Sergeev has only found the net once for his Chinese club this season. Danicek also pointed to the team’s lack of a reliable playmaker – Korea really could use some of that – and we don’t mean our fullbacks! This, compounded with injuries to Djeparov and central midfielder Azizbek Khaydarov, will not facilitate Uzbekistan’s objective in Seoul tomorrow. However, Koreans should not get too cocky. A general rule of thumb is that Koreans will get bossed around on set pieces (and we somehow have a problem with throw-ins into the penalty box?) and that’s how the Uzbeks broke the deadlock against Qatar. Our transition game is also noticeably weak, and Uzbekistan’s “strong, capable runners” will need to be properly neutralized. And need I remind readers about the state of Korea’s defense? It’s far from a foregone conclusion, this game. It will be a proper battle between two under-pressure sides that will determine which country will have the upper hand on qualification heading into 2017. While Uzbekistan will have two first-team players (or one, depending on what you think of Seongnam and Ulsan star Server Djeparov) absent, the Koreans have some injury problems of their own. Hwang Heechan picked up a shoulder injury in training and will be left out of the team sheet tomorrow, while Lee Chungyong is an uncertain game-day decision. Stielike’s took time to outline his “Plan A” and “Plan B” tactics to the media recently. His Plan A is a possession-keeping, mobile side, with capable, mobile wingers, overlapping fullbacks and a hard-working striker up top. It’s how he justified the inclusion of Lee Jeong-hyeop in this set of call-ups. Was starting Lee against Canada an indication that Ji Dong-won is to start the more important game against Uzbekistan? Or has the Ulsan striker made his way into a starting position with the goal on Thursday? What striker will unlock the stubborn Uzbek defense which has kept a clean sheet in 4 out of their last 5 games? Should Stielike give Lee Jae-sung a start? Heung-min’s mission will be to exploit the space that bombastic Uzbek rightback Denisov likes to leave behind him, I think Lee Jae-sung, deployed on the right wing (as the chances of him displacing Koo or Ki centrally seem highly unlikely) and drifting centrally, will provide intelligent one-twos and the kind of quick, fluid interplay, that has been the selling argument for (hopefully) an upcoming move to Europe and that will do just the trick against a stoic but not necessarily quick Uzbek central defense. Plan B? Kim Shin-wook. If Korea is having a bad time in the first half of this one, you can bet that Wookie will be there to try and latch onto long-balls delivered from deep by the China-based centrebacks, Hong Jeong-ho and Kim Ki-hee, who have both taken on more ball-playing responsibility (despite it being neither of their fortes). The Korean defense. The Taeguk Warriors’ last two home wins did not come with assured defensive performances, while against Iran, Team Melli’s early aggressive pressing made the Korean defense uncomfortable. You can be sure to see the Uzbeks try and force errors in distribution amongst the Korean backline (though probably with less stingy aggressiveness as the Iranians). Furthermore, Sebastian Soria had a field day against the Korean defense, while the team isn’t ready to properly commit anyone other than Jung Woo-young or Han Kook-young with proper defensive responsibilities in central midfield. 4 goals conceded in 2 games at home is worrying. Watch this. Who will start on the left? Though Park Joo-ho and Yun Suk-young both played 45 minutes in the friendly against Canada, and looked competent and at times threatening against an admittedly inferior opponent, there’s questions about their match fitness to last 90 minutes in a high-stakes World Cup qualifier. As such, it seems likely that Suwon Bluewings’ Hong Chul will be starting this one, and his combination with Son Heung-min down Korea’s left flank was run- and overlap-heavy, filled with energy and menace. With Danicek singling out the Uzbek rightback – Tukhtakhodjaev – as a weakness (open space behind), this could be an area of the pitch Korea could use to launch crosses or foray into the box with Son’s dribbling. Dealing with pace in the transition. Uzbekistan has some raw players with speed as an asset, and the Koreans are just sluggish transitioning from defense into attack (with our slow U-shape passing) as they are from attack into defense. There’s going to be tracking back to do and you’d hope to see some successful Han Kook-young tackles or Jung Woo-young shutting me up with a couple guided tours to the touchline. Broadcast: JTBC (Korea), AFC YouTube (Canada and others). For American-based watchers, the Tavern Twitter will probably have a few streaming links up a few minutes before kickoff. If not, you can simply follow our Live Twitter-cast coverage. It’s not a must-win, but it’s kind of a must-win. Finishing this turbulent year with an edge halfway through (hopefully) the final round of qualifying is crucial. A draw – or even, a defeat – plunges this national team into crisis mode with World Cup dreams evaporating quicker than you’d like to think. 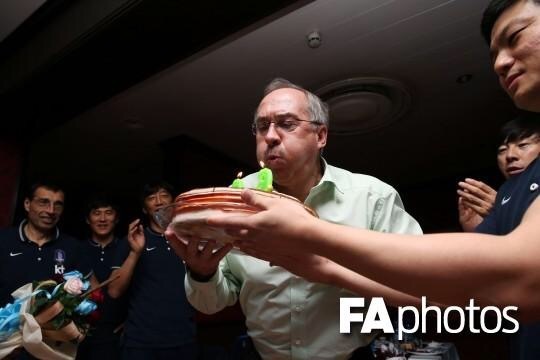 Uli Stielike celebrated his birthday yesterday – like him or dislike him, for the sake of the national team, we can only but hope that he’ll be getting many happy returns. so if Korea loses or draws, whose going to take over? Shin Tae Young? Tim do you think that if we get a new manager it’ll be deja vu? Korea pulled off a second place finish in qualifying last time under CKH. But that was a struggle for them.